Powers/Abilities: Possesses the strength and agility of a tiger. History: "This was the Africa of long ago, when a strange figure that was half-man and half-beast haunted the dark, moist forests of our great continent. His adventures were many, for wherever men dwell, so too does evil ... and this fierce fighting warrior called ... Tiger Ingwe." 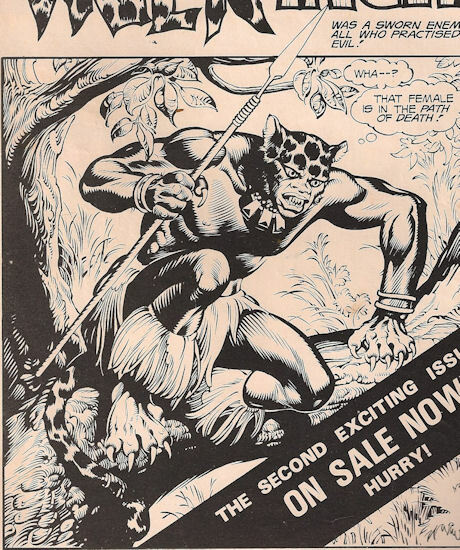 Comments: "A tiger, in Afri-Comics!? Maybe he escaped from a zoo?" Created by Richard Manville, with art by South Africa's Rufus Papenfus and other, unspecified American artists and writers. Unfortunately, the lack of native creators led to an unfortunate naming gaff, as ingwe / izingwe is Zulu for leopard. 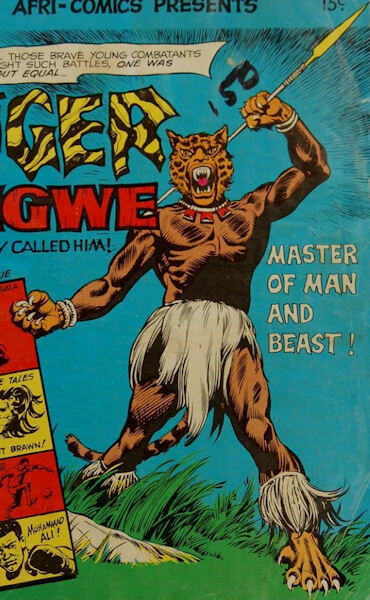 Like Mighty Man, Tiger-Ingwe was the brainchild of American publisher Richard Manville, but produced for South Africa and aimed at the country's black population, then living under Apartheid. However, the South African government saw propaganda potential in Afri-Comics, financially sponsoring them. The U.S. creators involved apparently didn't realise the true intent behind the comics, as they reportedly sought to include profiles on real life Africans the readers could relate to, such as the slain leader of the anti-Portuguese struggle in West Africas Guinea-Bissau, Amilcar Cabral, something the South African government vetoed. One group that did realise the comics were being used for propaganda purposes were the rioters of the 1976 Soweto uprisings, who destroyed newstands carrying Afri-Comics, an act that ultimately heralded the end of the titles.